I was pleasantly surprised by this one. The last older teaching book I had read was extremely disappointing. This one, however, was great. 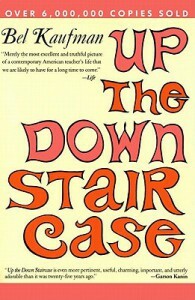 I think any non-teachers reading Up the Down Staircase would think it greatly exaggerated, but it's really not. It's pathetic how much of the book could have been written yesterday. I mean, if not for the out-dated technology, it really could have been. But Kaufman brought humor to the story and it was truly an enjoyable read. It left me hoping I have someone like Bea to guide me when I start teaching.